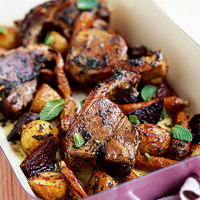 New-crop Jersey Royal potatoes are roasted with small fresh beetroot and baby carrots, then served with juicy minted lamb chops. Preheat the oven to 190°C, gas mark 5. Chop half the mint and keep the remaining leaves whole. In a shallow dish, mix the chopped mint with the vinegar, half the garlic, and 2 tbsp of the olive oil, and season. Add the lamb chops, turning them to coat in the mixture. Cover and place in the fridge until you are ready to cook (see Cook’s tip). Halve any larger potatoes and cut the beetroot into quarters. Put the potatoes, beetroot and carrots in a roasting tin and scatter over the rest of the garlic. Drizzle with the remaining oil and season. Roast for 30 minutes until tender. Meanwhile, heat a large, non-stick frying pan until very hot. Remove the lamb chops from the marinade, brushing off any excess, and fry for 3-4 minutes on each side. Reserve the marinade. Serve the chops on top of the vegetables. Pour the reserved marinade into the frying pan and simmer briefly. Drizzle over the lamb and top with the remaining mint. Although not essential, the lamb will benefit from being marinated for several hours in the fridge if time allows. Lamb chops with fresh mint deserve the full flavours of a Waitrose Cabernet Sauvignon. Its pure, succulent blackcurrant flavour is great with lamb and will stand up well alongside the vinegar, mint and beetroot.